Retroreflectors, or corner-cube prisms, are optical devices that return any incident light back in exactly the direction from which it came. The central design concept is a trio of mutually perpendicular surfaces such as is found at the corner of a cube (look up into the corner of the room where the ceiling hits the walls). If these three surfaces are reflective, a light ray will bounce off each in turn, with the net result being a precise 180° turn. (Ever hit a racquetball right into the corner and had it come right back at you?). Retroreflectors are in tail-light covers (feel the sharp bumps on the inside of one), bike reflectors, and in paints for road signs (very tiny crystals). The Apollo 11 retroreflector array, consisting of 100 corner-cube prisms in a 10×10 array. Each corner cube is made of fused silica (quartz) and is 3.8 cm in diameter. The palette is 0.45 meters square, and carefully designed to minimize thermal gradients across the corner cubes as the array is slammed into and out of the sun's rays as the moon's phase changes. This prevents thermal distortions from seriously degrading the amount of light returned by the reflectors. The Apollo 14 retroreflector array is very much like the Apollo 11 array in design: 100 3.8 cm reflectors in a 10×10 square pattern. Unlike the picture of the Aollo 11 array, this one has sunlight on its face, enabling a better view of the array of corner cubes. Is that a ziploc bag in the background? A close-up of the Apollo 15 array, which has 300 3.8 cm corner cubes in a hexagonal array. Because this reflector is three times larger than the previous two, it gets preferential treatment by the photon-challenged LLR stations currently in operation. 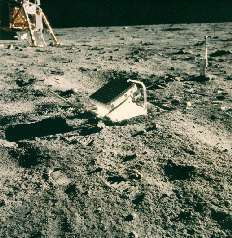 As of 1994, 6,300 of the 8,400 range measurements (75%) had been made to the Apollo 15 array. APOLLO will have much greater sensitivity, and will consequently visit the various retroreflectors in a more uniformly distributed manner. 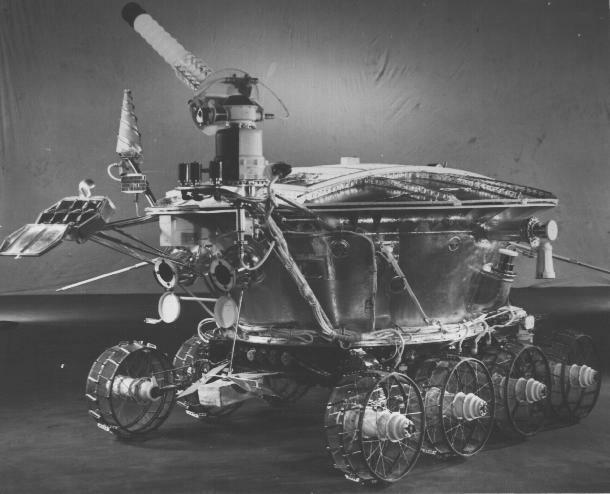 The Soviets landed two rovers on the moon, called Lunokhod 1 and Lunokhod 2, on the Luna 17 and Luna 21 missions in 1970 and 1973, respectively. These rovers were equipped with small retroreflector arrays each consisting of 14 corner cubes of triangular configuration (not cut into a circleimagine slicing off the corner of a cube with a knife). Each reflector is 11 cm on a side for a total package 44 cm long and 19 cm across. The picture at right of the Lunokhod rover shows the reflector jutting out in front (left). Lunokhod 1 was successfully ranged during its maneuvering phase, but then was not seen for almost 40 years until our project (with the help of the Lunar Reconnaissance Orbiter) re-discovered the reflector in April 2010. 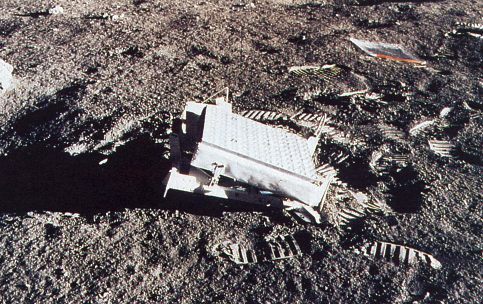 Now both Lunokhod reflectors are routinely used, though the large size of the cubes makes them more susceptible to thermal distortions, so that the return is about 30 times weaker in lunar daylight than in lunar night. 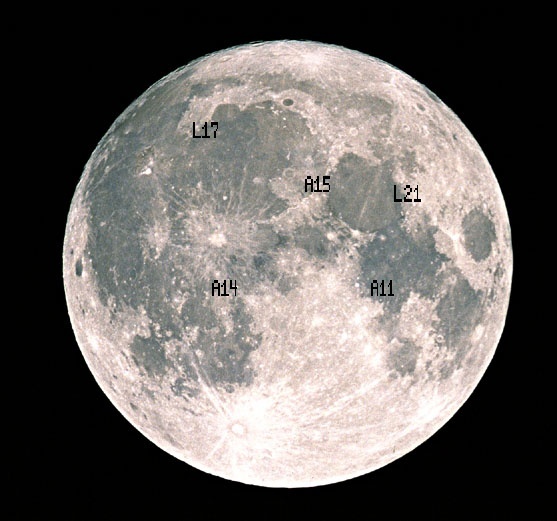 On the other hand, the larger size makes for a tighter diffraction pattern during lunar night, so the effective cross-section becomes slightly larger than the Apollo 11 and Apollo 14 arrays during these periods. Lunokhod 1 plays by this rule, but Lunokhod 2 has become about five times weaker than its twin reflector.